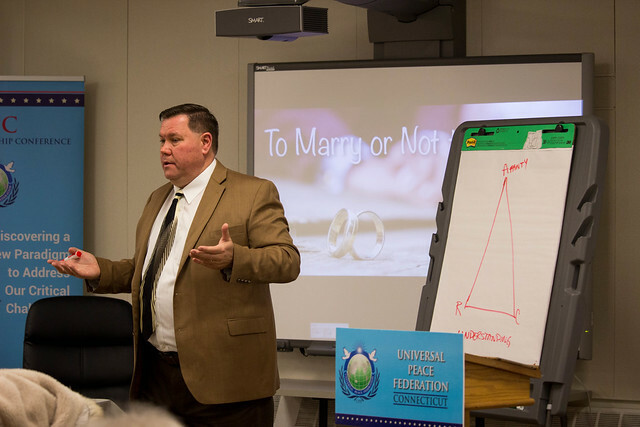 Bridgeport, United States—The UPF-Connecticut Forum on Marriage took place on February 23, 2019, in the pleasant atmosphere of the University of Bridgeport. This was by far the most challenging forum event that we have organized. The date had to be changed several times due to unforeseen circumstances, but we were determined to host this event before the end of winter. The date also coincided with the end of the public-school winter break, and many of our invitees, both teachers and parents, were traveling during that time. Still, we resolved not to postpone our event once again and were glad to welcome about 40 participants, including both guests and staff. The topic lent itself to a lot of interest and criticism alike, because over the last few decades, marriage has come under intense attack. In Connecticut, this is a special issue as we have one of the lowest marriage rates of any U.S. state. Nevertheless, we felt it was important to make a public statement on the importance and benefit of marriage as an institution that not only allows for God’s unique blessing and grace to be given but also forges a deeper commitment for the couple entering into this covenant and their future children. There are many social, economic, legal, spiritual and philosophical issues that need to be considered when dealing with the issue of marriage. Each speaker approached the issue from a different perspective. Mr. Bill Hawthorn, an executive with the Church of Scientology in Connecticut, offered an interesting, practical formula for deeper communication and understanding within a marriage. Mrs. Lynn Walsh, the director of the UPF Office of Marriage and Family, and Mrs. Cheryl Wetzstein, an award-winning journalist on marriage and family issues, gave presentations that ranged from practical tips to daunting UN statistics of adverse effects on children of non-marriage. They also gave some practical steps that we can take to help our families and communities. Increase the 58 percent rate of successful first marriages to 75 percent. Please talk about your own happy marriage. Encourage others to do the same. Decrease the rate of unwed childbirth from 39.8 percent to 30 percent (circa 1990). Monitor efforts to further change U.S. marriage laws, such as pro-polygamy bills. Marriage age-limit laws (e.g., will it encourage child brides?). More bioethics oversight and public education about selling/donating sperm and eggs and hiring surrogate mothers. Children are not commodities. Create more programs for both premarital and married couples. Mr. Greg Breland pointed out how much lawyers and child therapists actually benefit from the scourge of divorce and broken families. “The need for a spiritual awakening has never been stronger in this country!” Mr. Breland said. The question-and-answer session after each presentation gave everyone a chance to direct questions and comments to the presenter, and the roundtable discussions at the end were both engaging and valuable. Some younger guests commented that nowadays many young people don't entertain the idea of marriage because they seem to depend much more on their parents financially and also because the pursuit of their career becomes predominant in their life. Yet, the rise in cohabitation underlines a basic lack of commitment and respect. These qualities are fundamental in creating a stable family, which always has been the pillar of a healthy and flourishing society. After all, the family is the School of Love!